The stackable TiltPlate configuration allows the mast to extend above the TiltPlate. The boom truss u-bolts are positioned so the boom truss mast and cables do not interfere with the main mast in the normal or tilted over position. The normal offset of the moveable plate insures there is no interference between the main mast and the boom truss cables. There is an adapter for the KARLock to use it with the stackable models. Click here for the KARLock page and a picture of the adapter. You can stack a second TiltPlate or just use this option to mount a small antenna above the TiltPlate. 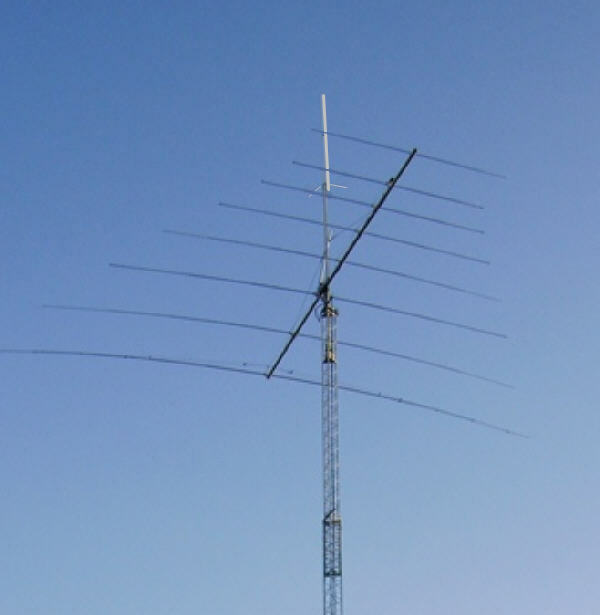 Some antennas that work are a 2M or 6M yagi or a UHF/VHF ground plane. The 6M yagi is the largest yagi that can be mounted above a TiltPlate WITHOUT recquiring a second TiltPlate. Here is an example of a UHF groundplane mounted above the TiltPlate on the main mast. Tip -- You don't have to stack antennas to use the stackable configuration. Some like to specify the STACKABLE configuration when also ordering a KARLock. The KARLock catch plate comes already mounted when you specify the stackable configuration. The catch plate is mounted to a short tube (that is supplied) instead of to the main mast. Either way works fine. WARNING: Stacking TiltPlates or mounting another antenna above a TiltPlate will put a significant additional load on your tower, mast, and thrust bearings. Be sure to consider this when designing your project. Array Solutions is an excellent source for information on heavy duty masts. Click here for an example. DX Engineering is another source. Click here for more information. Diagrams showing the "stackable" TiltPlate operation with a second "standard" TiltPlate mounted above. Note: instead of mounting a second TiltPlate on top, this is an excellent way to mount a 2M yagi and/or a vertical or ground plane above your yagi antenna. It can also be used to mount a 30M or 40M dipole above your yagi. Bob / WA5VSK -- Stackable TiltPlate with KARLock, lower antenna installed. Note: In Bob's installation, the boom truss cable is attached to the main mast. The preferred method is to install the boom truss mast on the moveable plate of the TiltPlate. The cable tension is then kept constant as the tower is lowered. Below - closeup shows the KARLock engaged. Click for more pix of Bob's installation on the main page.